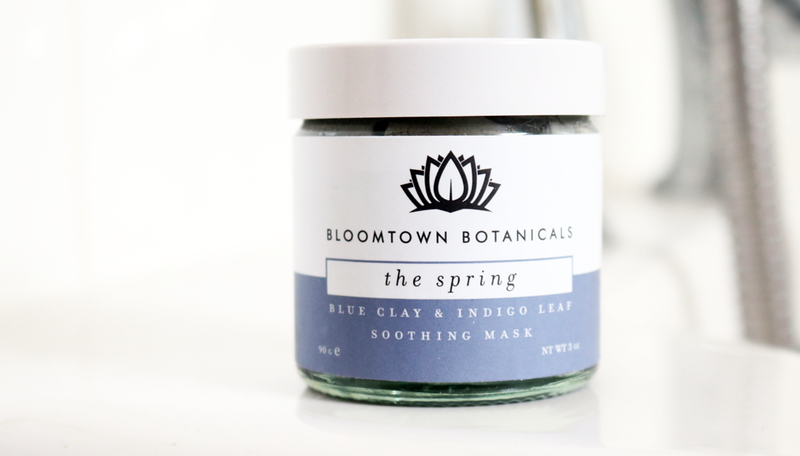 Mid-Week Pamper Treat: Bloomtown Botanicals The Spring Blue Clay & Indigo Leaf Soothing Mask review + Reader Discount Code! 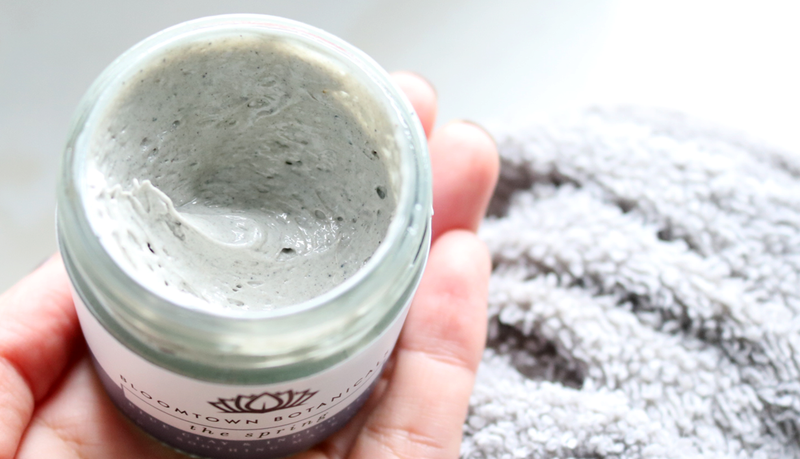 Ladies and gents, meet the latest addition to my ever-growing face mask collection and one of my new favourites for soothing sensitive skin; the Bloomtown Botanicals The Spring Blue Clay & Indigo Leaf Soothing Mask. Face masks have always been a regular feature in my skincare routine for a long time now, and I try to use one or two a week to keep my skin in tip-top condition. From pampering Korean sheet masks to heavy-duty purifying clay masks, you name the type, and I've probably got at least one in my bathroom cabinet to suit all kinds of skin problems and issues. As the clocks are due to go back later this month and the weather has now turned grey, cold and rainy, I've noticed that my skin has once again started to play up. It always does when the seasons change and getting back into the daily grind of Uni and all the stress that goes with that, certainly hasn't helped matters! Luckily though, I have an arsenal of soothing skin saviours on hand, ready to go. Self-care is massively important and a great way to de-stress, so slap on a face mask and let's get stuck into my new treatment obsession from Bloomtown Botanicals. 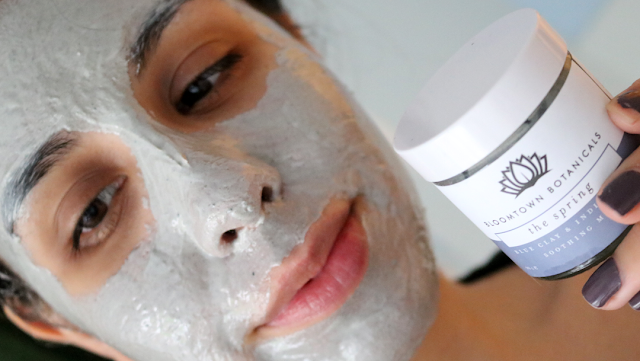 As the name suggests, the Bloomtown Botanicals The Spring Blue Clay & Indigo Leaf Soothing Mask is a soothing face mask treatment for sensitive skin, although I'd say that any skin type can benefit from using it, especially if you're feeling tired, stressed or just under the weather. It's been specially formulated to be 100% allergen and fragrance-free, is cruelty-free and suitable for vegans. This mask also won the Best Natural Face Mask award in this year's Beauty Shortlist Awards which is really impressive! Bloomtown Botanicals are a natural beauty brand who hand-craft all of their products in Cornwall so high-quality ingredients are key in all of their formulas. This soothing face mask contains just a handful of natural ingredients:- Plant-derived Glycerine, Natural Blue Clay (Bentonite), Radish Root ferment filtrate, Lactobacillus, Coconut Fruit Extract, Nettle Root powder and Indigo Leaf powder, and that's it. This face mask is free from Palm Oil, Sulphates, Parabens, PEGs, Petrochemicals, Mineral Oil, Phthalates, TEA/MEA/DEA, Synthetic Colours, Synthetic Fragrance and SLS. Apply a thin layer to clean skin, avoiding eyes and lips, and leave on for 15-20 minutes. It's gentle enough to be used daily, but I'd say using it just once or twice a week should be enough to keep your skin calm and happy. This mask has an interesting whipped texture like a thick mousse, yet it feels a little sticky to the touch. It was initially a bit difficult to apply with just my fingers, but as soon as the mask makes contact with the skin, it sort of ever so slightly 'melts' which makes it much easier to spread about. There's a nice subtle warming sensation at first and although the mask is technically fragrance-free, it does have a very light, fresh, slightly herbal scent to it, but it's not offensive at all and once on, I didn't really notice it. I left the mask on for the full 20 minutes and removed it with a warm cotton flannel which took it all off very easily. As the Bentonite Clay in this formula is in a non-setting base, it won't dry, crack or feel tight, so my skin was left feeling soft, hydrated and definitely soothed all over. I had some red, irritated patches and a few areas of dehydration before applying the mask, but afterwards, these were completely gone and my skin felt brand new again! This face mask is a fantastic way to 'reset' sensitive or stressed skin in a gentle, but effective manner, and it's an affordable way to get into green beauty as the jar contains up to 30 applications. Perfect to use all year round, but it especially comes into its own during seasonal changes like now if your skin likes to throw tantrums like mine does! Bloomtown Botanicals The Spring Blue Clay & Indigo Leaf Soothing Mask* (60ml, £12) is available from ecobeautycrew.co.uk - use WOLVES to get 10% off any Bloomtown Botanicals products until 25/10/2017 (not to be used in conjunction with any other offer).